Neuroscience, with its astounding new technologies, is uncovering the workings of the brain and with this perhaps the mind. The 'neuro' prefix spills out into every area of life, from neuroaesthetics to neuroeconomics, neurogastronomy and neuroeducation. With its promise to cure physical and social ills, government sees neuroscience as a tool to increase the 'mental capital' of the children of the deprived and workless. It sets aside intensifying poverty and inequality, instead claiming that basing children's rearing and education on brain science will transform both the child's and the nation's health and wealth. Leading critic of such neuropretensions, neuroscientist Steven Rose and sociologist of science Hilary Rose take a sceptical look at these claims and the science underlying them, sifting out the sensible from the snake oil. Examining the ways in which science is shaped by and shapes the political economy of neoliberalism, they argue that neuroscience on its own is not able to bear the weight of these hopes. Hilary Rose is Emerita Professor of Social Policy at the University of Bradford. Together with Steven Rose, she is author of "Genes, Cells and Brains" and "Alas, Poor Darwin". 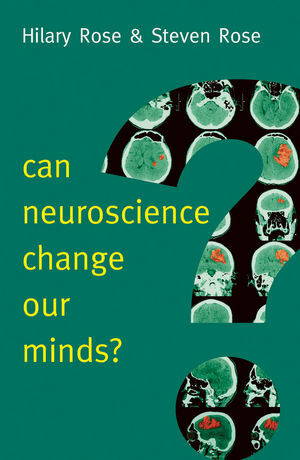 Steven Rose is Emeritus Professor of Neuroscience at The Open University. He was co-founder of the British Neuroscience Association, and has won numerous prestigious awards, including the Biochemical Society medal for communication in science and the British Neuroscience Association's lifetime award for "Outstanding contributions to neuroscience". "This book is a bold, forthright and courageous commentary on looming cultural trendsa true tour de force."